Red Bull Media House and Bongfish have announced the launch of Red Bull Racers on iOS and Android devices. The game was designed in association with Carrera, bringing the famous slot car racetrack system to mobile gamers across three racing series: Formula, Offroad and Street. Depending on the course, gamers will see their cars driving through loops, jumping over gaps and drifting around corners, with over 100 events in this launch version of the game. 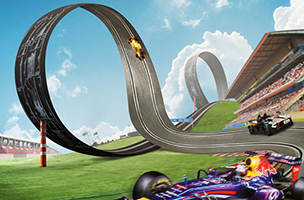 Red Bull Racers offers four single-player game modes: Cup, Elimination, Rivals and Endurance. In each, players can choose between three difficulty settings to find the experience that’s most entertaining for them. There are nine cars available at launch, including the Infiniti Red Bull RB9, Arden GP3 and VW Polo R WRC, with more being developed for future app updates. In total, Red Bull Racers offers 21 courses and 108 events, along with one multiplayer game mode called Friends Rival Races. Via Facebook Connect, users can challenge their friends to beat their best times. In doing so, the game offers limitless play, as gamers can continue to challenge their friends indefinitely into the future. Rounding out the experience are global and friends leaderboards, an achievement system and featured events. These events should encourage users to frequently come back to the game to see what’s new. In addition to new cars, more courses are also being planned for release throughout the year. Red Bull Racers is available to download for free on iOS and Google Play. You can follow the game on AppData, our tracking platform for mobile and social apps and developers.